‘Capture the Moment’ is the theme of National Assisted Living Week September 9 – 15. The Greens at Greenwich has activities all week in celebration of ways our residents realize their dreams and seize the day. The Photography Club has been preparing a collage presentation which will be showcased in The Greens lobby. To create the collage, we visited 7 residents rooms for a tour of their life as seen through photos, artifacts, art and life moments. Our group spent 30-40 minutes looking and experiencing stories. Some spouses, children and family members participated. The collages capture the magic of the moments of extraordinary lives. Lots of memories and lots of laughter. As we left one room and went to the next, we heard, “Wasn’t” that fun?”, “I didn’t know that about Eddie.” And as we traveled together around to the rooms we enjoyed singing. Common moments centered on families, friends, travel, momentos, hobbies and sports. We were delighted to see Ms. New York, Carol wearing her sash and showing the newspaper article of her win. Loulette showed us a black and white photo taken many years ago in Switzerland with a house where she spent summers with her grandmother. 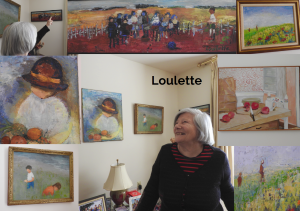 It was a warm memory along with the beautiful oil paintings she painted over her lifetime. 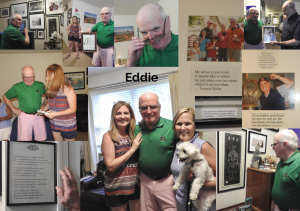 Eddie’s room was a photographic exhibition of travels around the world, family, milestones along with framed quotes and poems he liked. Sheldon had a photo of the home in Pennsylvania where he was born 100 years ago. Bob loves puzzles and his room captured a variety of beautiful puzzles that he framed to personalize his room. Hanging prominently in Peter’s room is his poster and framed photo of the NY Marathon which he ran in 1989. Entering Virginia’s room is a vignette of the art gallery she owned for years. We enjoyed her stories of the art and meeting Salvatore Dali as well as her poems. Surprises along the ‘Capture the Moment’ Photography Club’s experience included the framed menu from Carol’s parents restaurant with steak for fifty cents; Eddie’s sisters story of how their parents met; Virginia as a Radio City Rockette. We hope you will stop by The Greens at Greenwich and take a look at the collages capturing the moments of some extraordinary lives. Photography Club meets every other Tuesday. We explore famous photographers, travel to fabulous locations, find interesting still life, garden and other photographic moments. As the group leader for over 3 years, it is an experience that has exceeded my expectation as I have met some outstanding accomplished and truly enjoyable people.